My niece made this play dough with the children she stays with. She said they had a great time with it, and it was a fun snack too. Mix all the ingredients in a bowl. Add enough powdered milk to make the mixture dry enough to handle. Shape into balls and enjoy. Don't worry if they would like a taste. It's all edible. 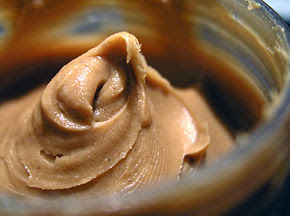 I think sunflower seed butter could be used instead of peanut butter for those with allergies. A little more dry milk will probably need to be added since it is a bit runnier than peanut butter, but still yummy and super fun! Dear Once Upon a Parent, Thanks so much for the idea of using sunflower seed butter instead of peanut butter. I must admit I didn't even know they had such a thing.